UNIONVILLE, C.T., Mar. 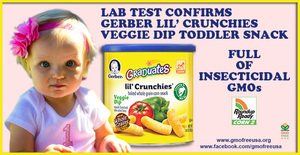 31 /CSRwire/ - GMO Free USA today published the results of independent lab testing which documented that Gerber Lil’ Crunchies Veggie Dip Baked Whole Grain Corn toddler snack contains high levels of herbicide tolerant, insecticide producing genetically engineered corn. The public interest nonprofit recently launched a program to test popular food products for genetically engineered ingredients (GMOs), as well as testing for the herbicide glyphosate, heavily sprayed on GMO crops. "As a physician in Hawaii I remain gravely concerned about the impact pesticides and pesticide dependent crops have on our children's development," said Josh Green M.D., Hawaii State Senator.